Will this year’s festival of fire fuel another resistance in Iran? This year, the Iranian fire festival of Chaharshanbe Suri, will be marked on Tuesday, March 14, 2018. It may also mark the beginning of a new uprising against the clerical regime, in light of a series of recent calls to action by the leading Iranian opposition group, the People’s Mojahedin Organization of Iran (PMOI/MEK). A number of protests have already erupted across the nation in the days leading up to Chaharshanbe Suri. Young activists have been writing anti-government graffiti on walls and posting pictures of Iranian opposition leaders Massoud and Maryam Rajavi in several cities, including Tehran and Isfahan. Iranian social media has a Farsi hashtag of “Dictator on fire.” #Firefest has been widely used in social media, highlighting the overlap between the end-of-winter cultural celebration and the upsurge in political activism. Chaharshanbe Suri takes place on the last Tuesday before the Iranian New Year celebration of Nowruz on March 20. It has always been a source of conflict between the theocratic government and the open-minded and culturally diverse population. The regime’s struggle to control that population means that public gatherings in general are seen as threats. Security officials have predictably been making plans for the suppression of Chaharshanbe Suri crowds, especially because the MEK call to action has aroused the regime’s paranoia over potential consequences of traditional activities. The holiday holds powerful symbolism. 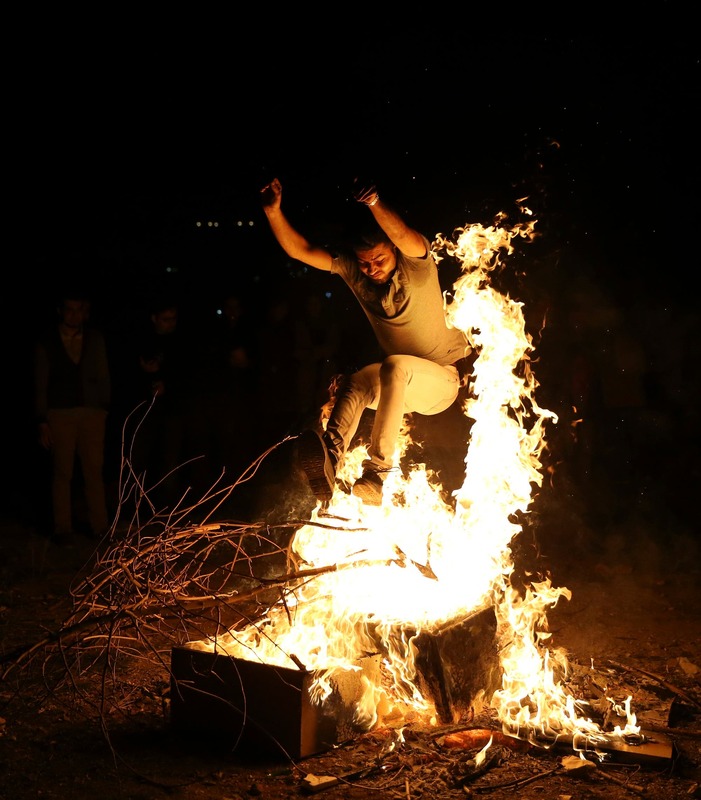 Chaharshanbe Suri’s rituals include jumping over small fires as a sign of purification, which can be seen as a manifestation of the people’s willingness to walk through the fire of a mass uprising in order to achieve their long-sought goals of a democratic society. This year’s fire festival is made even more significant by its proximity to the mass uprising that rocked the regime in late December and January. In those demonstrations, which rapidly spread to virtually every major city and town in the country, people chanted slogans that rejected both the “reformist” and “hardline” factions of the regime, instead demanding the ouster of the Supreme Leader, Ali Khamenei, and regime change. According to the MEK network, more than 8,000 people were arrested during those protests, and at least 50 activists killed by the regime’s security forces. As recently as the start of this month, reports were still leaking from Iranian jails regarding detainees who have suffered torture and terrorization. To date, at least 14 have been tortured to death. The MEK network inside Iran has closely followed any public statements and obtained information detailing the mobilization of Intelligence Ministry operatives and Revolutionary Guard-affiliated militias to stop public gatherings from taking place or turning political in nature. Divisions of the Basij militia are expected to be stationed in every major municipality, and in unprecedented numbers. In light of the atrocities which followed the January uprising, it is imperative that the international community keep a close watch on the situation as the New Year celebrations take shape and begin to pose a threat to the clerical regime. The Iranian Resistance has already called upon the UN and its member states to investigate the recent crackdown and to make it clear that such abuses will not be tolerated. This message is now even more timely, given the possibility of another, larger clash between the regime and the Iranian people. Despite the regime’s best efforts to suppress and marginalize the MEK, the organization has steadily gained a larger following among the people, especially the youth. This was underscored by Khamenei himself, when he acknowledged that the MEK played a leading role in the January uprising. It has been apparent once again in the public responses to the organization’s calls to action. The world must never underestimate the lengths to which the regime will go in order to prevent the MEK’s pro-democracy agenda from taking hold. After all, in the summer of 1988 alone, 30,000 political prisoners, mostly affiliated with the MEK, were executed as part of an effort to stamp out all opposition. Sadly, the world paid little attention to those killings, and then repeated this mistake over and over again as the regime cracked down on one protest movement after another. The United States seemingly broke this pattern as the uprising began in late December, when the White House issued statements of unqualified support for the Iranian people. It is time for the world to support the people’s desire for regime change and back it up with concrete political measures that will prevent Tehran from suppressing Iranians’ efforts to voice their opposition to theocratic rule. Iran is not only moving towards a New Year on March 20, but also into a new era of freedom. Safavi (@amsafavi) is a member of the Foreign Affairs Committee of the National Council of Resistance of Iran.